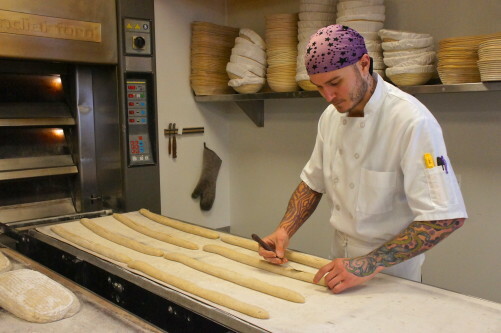 Bread, especially bread made with wheat flour, has come under scrutiny in recent years. Some nutritional experts and consumers have turned against it, viewing it as the root of a variety of health issues, from gluten sensitivity to weight gain. These sentiments spawned a rapid rise in interest in gluten-free bread products. But there is a counter-movement that says people need not give up bread, a diet staple in most cultures around the world since the dawn of civilization. Instead, their advice is: Eat better bread. Bread made from wholesome whole grains that contribute to health, rather than the commodity wheat used for most bread that is grown more for its high yields than its nutritional (or flavor) value. The bonus is that bread made the better way — which also is the traditional way — tends to be delicious. 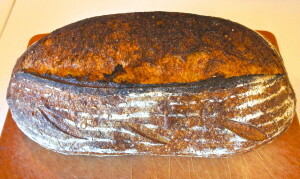 These are hearty, crusty loaves that eaters can savor, rather than wolf down to fill their bellies. And along with the increasing availability of these types of Good Bread in the marketplace, they also are surprisingly easy and inexpensive to make at home. 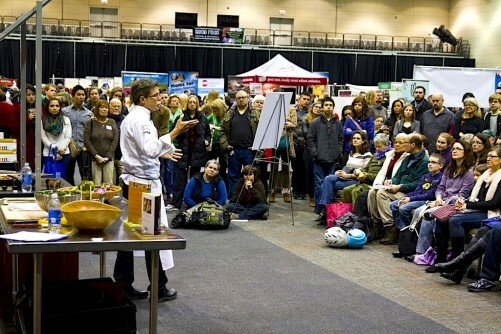 These are things that attendees at FamilyFarmed’s Good Food Festival can learn by attending a special master class conducted by Greg Wade, the head baker for One Off Hospitality, one of Chicago’s leading restaurant and retail food groups. 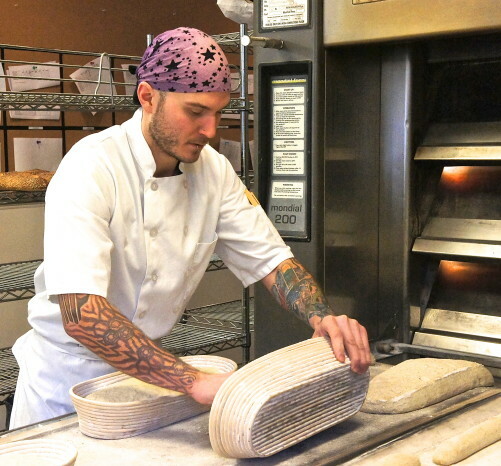 Wade will discuss his advocacy of better bread, while teaching class participants how to make it, at the master class on Saturday, March 21 at Chicago’s UIC Forum. “I think we’ve gotten a pretty good method of how to make this approachable and how to make it not intimidating,” Wade said in an interview at his Publican Quality Bread bakery near “Restaurant Row” in Chicago’s West Loop neighborhood. The theme will be reinforced at the Good Food Festival by a workshop led by Dave and Megan Miller, whose Baker Miller bakery, restaurant, and millhouse has made a big impact on the city’s food scene since it opened last fall. They will demonstrate how to mill flour, oatmeal, and polenta at home using local and heritage grains and why this will change the way you bake. For Wade, too, it all starts with high-quality grain. “We’re really trying to find good, locally sourced flours,” said Wade. He noted he gets most of his flour from Spence Farm, a pillar of the regional Good Food movement located in Fairbury, Illinois, about a two-hour drive southwest of Chicago. According to Wade, Spence Farm produces 13 different kinds of grains specifically for his bakery. His breads are served at One Off Hospitality restaurants created by top chef Paul Kahan, such as Blackbird, Nico Osteria, and The Publican, and a growing number of other clients. His loaves are sold retail at Publican Quality Meats, an adjunct to the restaurant that is well known for its house-processed, locally produced meat cuts, sausages, and charcuterie. Publican Quality Breads also will be available soon at Treasure Island, a local supermarket chain. … then pushes them into a 500-degree oven. Wade is a thoroughly modern baker, with copious amounts of body art. Like many people in the food trade, the Wisconsin native started off in another direction, entering college in Milwaukee with the intention of becoming a German teacher. He determined pretty quickly that was not going to be his career path, and he switched to the culinary arts program at the Illinois Institute of Art in Chicago. It did not take long after his graduation for his work in restaurants to attract high-level attention. He was hired first by chef Stephanie Izard when she was launching her Girl and the Goat on Restaurant Row that has earned her acclaim well beyond Chicago. 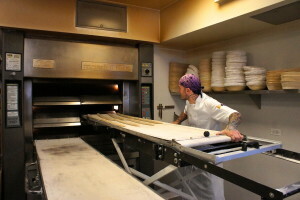 There Wade had to conquer one of the great challenges in the bread world: baking in a wood-burning oven, a technique notorious for its challenging temperature control. He got to work with a more conventional oven after Izard developed her Little Goat Diner across the street in 2012, which has a small retail operation attached. He baked there until Kahan recruited him last year to open the wholesale bakery that became Publican Quality Bread. When asked the biggest challenge he had to overcome that also would have to be mastered by home bakers, Wade said it’s all about the dough. Attendees at Wade’s master class at the Good Food Festival will certainly come away with a better sense of how to learn that feel. 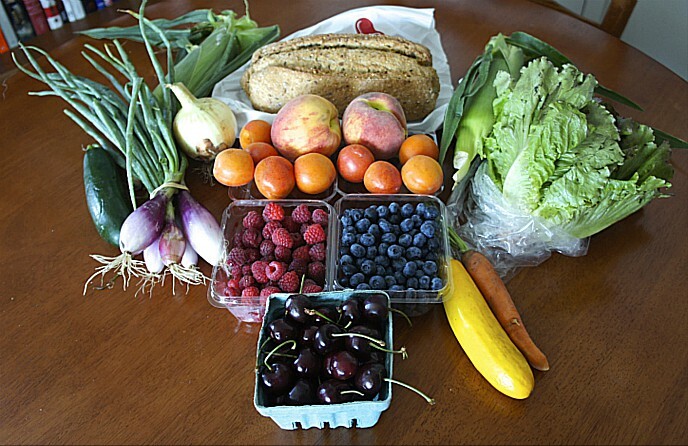 For more information about FamilyFarmed’s Good Food or to buy tickets, please visit the event website. This entry was posted in Ancient grains, Bread, Commodity agriculture, Eating Disorders, Fermentation, Food and health, Food Artisans, Food Entrepreneurs, Good Food business development, Good Food Dining, Good Food Festivals, Good Food restaurant trends, Heirloom foods, Sustainable food cooking, Sustainable food retailing and tagged Baker Miller, Good Food Festival, Good Food Festival & Conference, Greg Wade, One Off Hospitality, Paul Kahan, Publican Quality Bread, Publican Quality Meats, Spence Farm, Stephanie Izard, Treasure Island. Bookmark the permalink. Just watched The documentary Sustainable I was so impressed by what you are doing with your Bread. I do feel a lone pioneer as I mill my own grains and use Heritage grains epically Kamut Khrosen wheat, Spelt, rye and the best organic wheat I can source from the UK which is never that great. I was so interested in Einkhorn Espically that it will be good for gluten free. I was working in Germany with some Doctors looking over 5 years with patients We found that 96% of people who are Gluten intolerant are ok with Kamut and 56% with Spelt. Also the health benefits from milling your own flour is amazing! 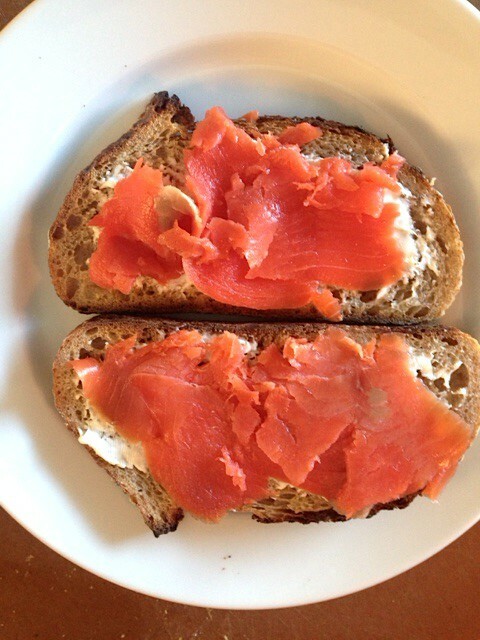 The taste and flavour and Sourdough is just great. What a shame you are so far away. It would be do nice to see shay you are doing and how I can share new methods with my students. Thank you for your comment, Vicky. I will forward it on to Greg Wade, who is as awesome as the movie suggests. Is there anyway we can order Loafs of bread from Greg? Please let me know where and how I can order. I’d recommend calling Publican Quality Bread to see what options might be available. Their website has a number for wholesale sales: 312.605.1618. If that’s not the right person, I’m sure they can connect you.